RoseLee Goldberg amazed with PERFORMA 05, billed as the city's first biennial of 'visual art performance.' Working with a tiny staff, a shoestring budget and no institutional affiliation, Ms. Goldberg put together a program that covered a lot of aesthetic bases--old school, just out of school, high-tech, no-tech--and encompassed more than 60 scheduled events… all of which makes the prospect of PERFORMA 07 shine with promise. --Roberta Smith, the New York Times This volume is the first in a series of important publications drawing content and inspiration from the PERFORMA biennial. Featuring inventive documentation by the 100 artists who made the first PERFORMA so extraordinary, it offers an exhilarating view into contemporary visual art performance and "performs" as a collective artists' journal might. Vibrant photographs of each artist's performance are accompanied by their scripts, sketches and storyboards, providing unique insight into process and upending conventions around archiving performance. Lively interviews with some of the most significant artists of our time--including Francis Alÿs, Tamy Ben-Tor, Jesper Just, Marina Abramovic, Gelitin, Laurie Simmons and Mike Smith--appear alongside context-setting essays by some of our most inspired young curators. PERFORMA founder RoseLee Goldberg, who pioneered the study of performance art with her seminal book Performance Art from Futurism to the Present (1979), presents an authoritative introduction addressing the genre's many forms--radio broadcast, dance, live installation, new technologies, film and video, music, historic reconstructions and lecture-as-performance among them. 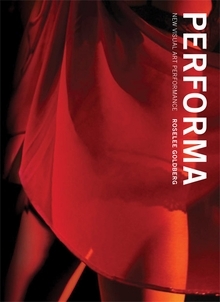 PERFORMA is not only an invaluable reference, it is a new kind of guide to cultural life, a time capsule of this very moment in New York's eminent performance history, complete with profiles of the city's nonprofit biennial venues that, like this book, give ephemeral art a physical place in which to persist. Paperback, 7 x 9.5 in. / 272 pgs / 215 color / 50 bw.